This guide is for the 21.5" Mid-2011 iMac 2.5Gh with discrete AMD Radeon 6750m. I have been using this setup since November 2016 (nearly 10 months at time of posting). Before Nvidia released Pascal web driver support for macOS I only used the eGPU for gaming in Windows 10 using BootCamp. After macOS support was released I have not booted back into Windows for anything save upgrading to the Creators Update and DirectX 12 games since they are not yet fully supported in Wine. This setup has been in constant daily use with macOS Sierra since April 2016 (nearly 6 months at time of posting). I have never attempted to get the internal screen working. NOTE: I do not use a molex connector or external power supply. I use a regular universal AC adapter which came with an assortment of connectors and has a voltage switch for 12 volts. The graphics card I use receives all its power from PCIe slot and does not require a six or eight pin connector. If your card is not the same as mine (EVGA GTX 1050ti SC 4GB) then make sure that its maximum power draw does not exceed 75 watts. People might go ape bananas over this saying that the PCIe slot in the Thunder2 only allows 25 watts through but they are wrong. I saw one of the engineers working at AKiTiO confirm that the Thunder2 does in fact deliver 75 watts over PCIe while discussing the differences they implemented for the OWC Helios on some forum somewhere ( https://egpu.io/forums/thunderbolt-enclosures/75w-from-slot-on-the-akitio-thunder-2/). I must reiterate that I have been using this setup for nearly 10 months on a daily basis. Using a normal AC adapter the Thunder2 automatically turns on at boot and turns off at shutdown. Just make sure your AC adapter is 90 watts or more and can be set to 12 volts. This gives 75 watts for graphics card with the remaining left over for the Thunder2 board and Thunderbolt cable. Using a normal ac adapter the Thunder2 automatically turns on at boot and turns off at shutdown. Just make sure your AC adapter is 90 watts or more and can be set to 12 volts. 2) Remove case from Thunder2 enclosure and install graphics card. I leave the case off the enclosure for increased cooling. This is really up to you and really depends on its location. 3) Decide where to place the enclosure. I put a shelf/risor underneath my iMac and put the enclosure there. This enables line of sight and easy access for dusting. Make sure you put it somewhere that is protected from things that could fall and drinks that could spill. 4) Open System Preferences -> Displays and click on the 'Arrangement' tab. Setup the displays as they are on your desk and then drag the tiny white bar (representing the menu bar) onto the external monitor. This will make your external monitor the main display meaning that all apps launched on this monitor will be using the eGPU. If an app opens onto your iMac screen then it is most likely not using the eGPU but the discrete GPU inside the iMac. Again, if your iMac boots to login screen or Desktop then you are good and can continue on to Step 3. 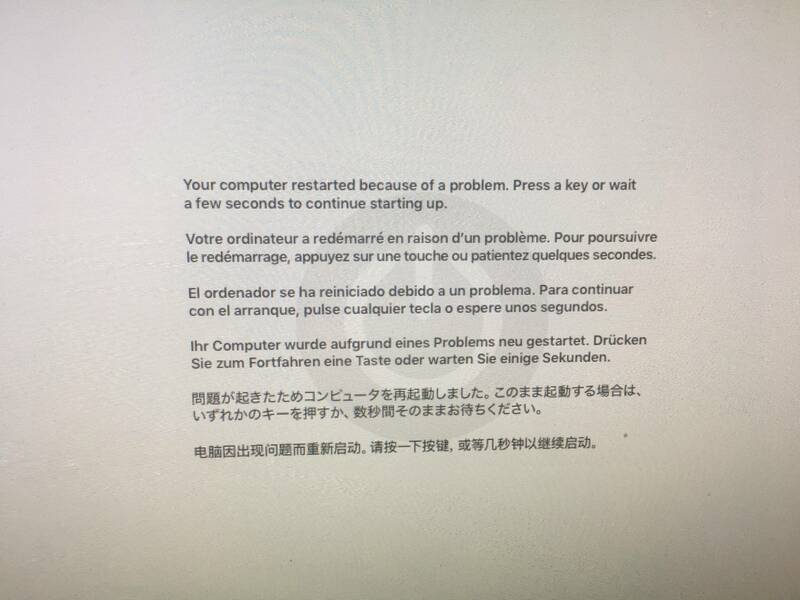 If you iMac reboots and displays a grey screen with a "Your computer restarted because of a problem" then you have most likely entered a boot loop. c) You may click the mouse to continue the boot process. If your iMac boots to the login screen or Desktop then you are good. If your iMac reboots and displays the grey screen with "Your computer restarted because of a problem" then unplug and continue to Step D.
d) Unplug the Thunderbolt cable from your iMac and prepare yourself to quickly plug it back in. e) Use a mouse click to dismiss the paragraph screen and continue the boot process and immediately plug the Thunderbolt cable back into the iMac. It should now continue the boot process and display the login screen or Desktop. If your iMac doesn't continue the boot process and reboots then unplug the Thunderbolt cable, click away the warning paragraph and plug the Thunderbolt cable in AS SOON as you see the Apple logo and before the progress bar displays. It might still work after the progress bar displays but doing it before is more reliable. NOTE: I have a Do-It-Yourself Fusion drive setup with an aftermarket SSD and stock HDD so the timings for your setup might be slightly different. This is the process that works for my iMac. When the Nvidia web drivers were released I had to do this hot plug process every time I booted my iMac. However, I now only have to do it every other week or so. If you encounter the grey screen with "Your computer restarted because of a problem then you'll most likely have to use the hot plug method. When launching some fullscreen games the iMac screen will flash on and then off or even stay on. Just continue gaming as usual and after quitting these games the iMac screen will be enabled again. All you have to do is use DisableMonitor in your menu bar to disable it again. iStat Menus can display the current temperatures in the menu bar of various components in your iMac. I have place the CPU temp reading in my menu bar to decide if I should increase the fan speeds. I also have the GPU temperature reading there but I am unsure whether it represents the discrete GPU or the eGPU. If you are gaming then I HIGHLY recommend increasing fan speeds. Apple does it automatically but they still tend to prefer quiet operation over cool components. I prefer to keep my CPU temp below 50℃ during normal operation and below 56℃ during gaming. This is overly cautious for the average user. I use the 'Step Up' profile for normal operations and 'Bit More' for gaming. The 'Midway' profile I created for exporting video when using apps that only use CPU for encoding and aren't accelerated by the GPU. You can choose to increase only the CPU fan. I raise the speed of all fans in case that helps the flow of air into and out of the iMac but I am unsure it makes any difference. 1) Install Nvidia drivers and shutdown with Thunderbolt cable unplugged. 2) Plug Thunderbolt cable into iMac and boot. I never had to hot plug in Windows 10. If you just get a black screen then force restart by holding down the power button until your iMac turns off and then try again. It will eventually work. 3) Change your Display Settings to 'Only display on Monitor #'. This should disable your iMac screen and turn off the backlight. 4) Install EVGA Precision XOC and reduce 'Power Target' to 70%. I did this just to reduce the power draw over the PCIe slot in Windows. I don't know if it does this. It's just a better safe than sorry solution since I don't trust Windows. I only did Extreme and High at 1920x1080 and 1600x900 since they resulted in 30FPS and 60FPS. I have been playing everything at 1920x1080 at Maximum settings without problems so far. My doubts now are how to install the egpu in Windows 10. How did you solve the thunderbolt driver installation in Windows 10? I never had to install any Thunderbolt drivers in Windows 10. The Akitio Thunder2 didn't come with drivers either. 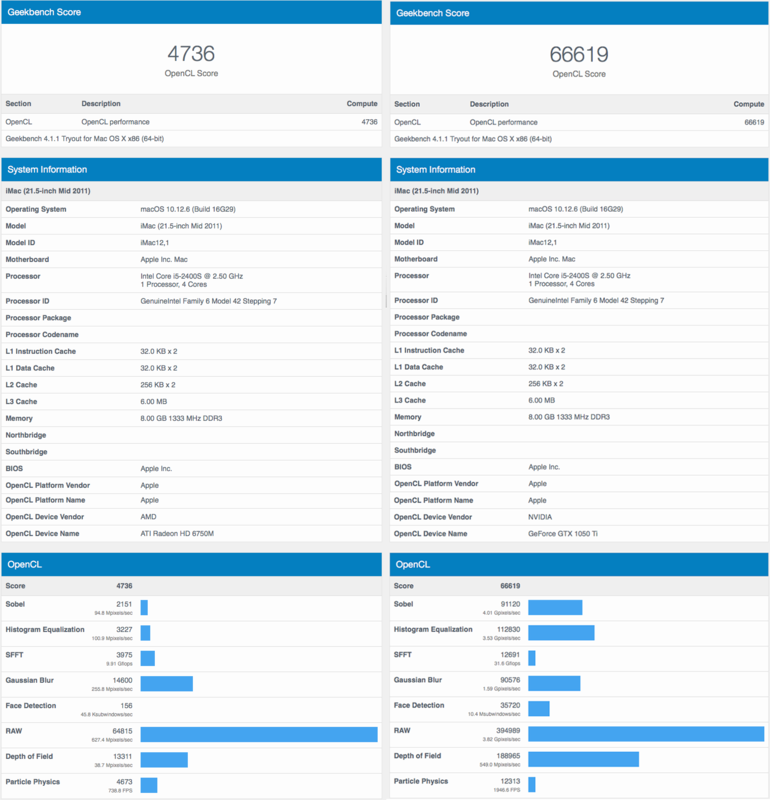 Mid-2011 iMac with AMD dGPU and no iGPU. Akitio Thunder2 with EVGA 1050 ti SC 4GB. EVERYTHING WORKED!!!! Games, benchmarks, video editors and Photoshop. SLEEP WORKS!! I've left it for 40 minutes and the system resumes just fine. The eGPU fans remain on and when it wakes up even kept my internal screen disabled via DisableMonitor. RESTART WORKS!! The external monitor remains black but enabled until after login on the internal screen. COLDBOOT WORKS!! In Sierra I would occasionally have to plug the eGPU in at the Apple Logo during boot. Now I can leave the eGPU plugged in all the time. The login screen spans both monitors during coldboot unlike when restarting. NOTE: Do NOT try to enable SIP after you have eGPU working. The login screen will have a light blue background instead of the High Sierra wallpaper. It will still work if you login only once but with strange artifacts on the external monitor. Everything works but anything that is macOS system GUI like Finder and System Preferences will go bonkers if you drag the windows around. The Menu Bar and Desktop would also get ghosts of previous menus and windows. The internal screen remained just fine. If you logout and login again both screens will turn black with only the mouse displayed and allowed to go back and forth between them. I tried everything to get it working again: every combination and permutation of hot plugging, booting, plugging in while logged in, plugged in at login, reinstalling Nvidia web drivers, enabling SIP with and without kexts, reinstalling NVDAEGPUSupport-v1, changing monitors, colors, refresh rates and more. Finally just reinstalled High Sierra fresh and repeated steps at beginning of post to achieve success again. This time I used the Nvidia Web Driver 378.10.10.15.121 since it was released by then. Bootcamp and Windows 10 also work just as before only now with a curious quirk. In Sierra with goalque's automate-eGPU script I would just hold [option] at boot and select the Windows partition. Sometimes it would display black screens on both monitors and never continue booting. The rest of the time it would boot up on the internal screen and then enable the external monitor when ready for login. I would just restart until it recognized the eGPU. Now in High Sierra with yifanlu's app Windows absolutely refuses to recognize the eGPU at boot unless it is designated the Startup Volume. You can do this in System Preferences or by holding [option] at boot as normal and then holding [control] while selecting Bootcamp using the mouse. The up arrow below the boot volume will turn into a circular arrow. Doing this Windows recognizes the eGPU every time. I never had sleep or cold boot working consistently in Sierra and am elated to finally be able to leave the Thunderbolt cable plugged in all the time. Works Perfect. yifanlu you are AWESOME!!!! With macOS working consistently I have not booted into Windows for quite a long time now I'm afraid. I don't even have a BootCamp partition anymore. I went to a dual SSD setup last Black Friday and never got around to installing Windows again. The only advice I can give you is outdated I'm sure and you've probably already tried it since it's listed just above. The last time I used Windows the partition would have to be designated as the Startup Volume in System Preferences in macOS. This makes it always boot into BootCamp and use the eGPU. The eGPU was always plugged in and I never hot plugged for either OS using the old yifanlu method. I might be able to try installing Windows again sometime over the weekend to see if it still works. I'll be using Windows 10 October 2018 Update and the Purge Wrangler script with the same EVGA GTX 1050ti SC 4GB in an AKiTiO Thunder2 as my first post. I'm sorry I can't help you at the moment as I'm sure you are frustrated. I'm waiting on Nvidia to release Pascal drivers for Mojave so I can feel your pain. I got it working again. I plan on updating the whole build guide with more in depth steps but that will take some time. Here are the quick steps I took to get it up and running if it helps. 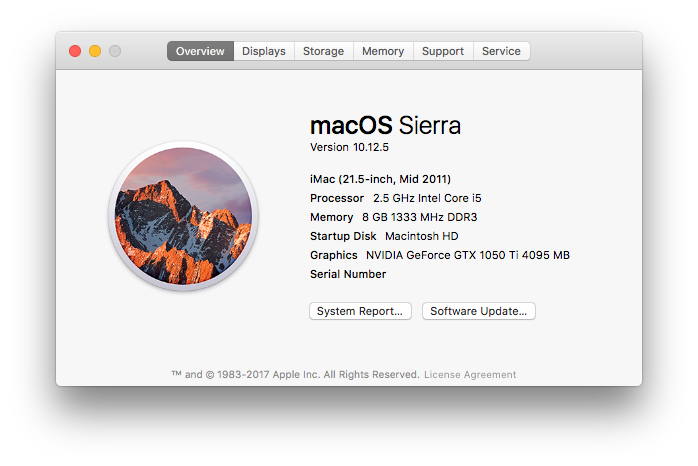 I start with a working install of macOS High Sierra 10.13.6 (17G5019) with all security updates installed. I use the Purge-Wrangler script to install NVIDIA Web Drivers and to enable NVIDIA eGPU Support. Ti82 Devices are Disabled in Purge-Wrangler since I use an AKiTiO Thunder2 enclosure. I leave the Thunderbolt cable plugged in at all times for macOS. The eGPU turns on and off with the iMac. I don't know if any of the macOS stuff has any effect on the Windows side of things but this is what works on mine. For Windows I first went to Microsoft and downloaded the ISO for the 64-bit version of Windows 10 October 2018 Update. I then went to Apple and downloaded Boot Camp Support Software 5.1.5621. This has support for 64-bit versions of Windows 7, 8 and 8.1 on our iMac 21.5-inch, Mid 2011. I used Disk Utility to create a new partition and Paragon NTFS for Mac to format it as NTFS. I do this to avoid using Boot Camp Assistant and Windows Installer issues. I installed Windows without connecting it to the internet during the setup process. Once I was on the Desktop I immediately installed the Boot Camp Support Software. I also installed Bonjour Print Services and iTunes just to get more Apple in there. After those were installed I checked for more updates using Apple Software Update. This found a Wifi Update for Boot Camp that I also installed. Only after all the Boot Camp software was updated did I use Windows Update to get all those updates. There were the usual Windows Defender Definition updates, some content updates for Windows and a Cumulative Update. I installed all of them and then installed some more it found after that. Once all Apple and Windows Updates were installed I went to Nvidia and downloaded the GeForce Game Ready Driver 417.71 for Windows 10 64-bit. I tried to install this only to be greeted with a window stating that installation would not continue since there was no Nvidia hardware detected. I plugged in the eGPU and there were no notifications or sound to indicate Windows recognized it. I tried to install the Nvidia drivers again just to see the same "No Nvidia hardware detected" prompt which confirmed Windows didn't see the eGPU. I left the Thunderbolt cable plugged in and rebooted. There was the normal gray screen at boot which was then followed by a black screen. The black screen should have been Windows booting but nothing ever happened. It just stayed a black screen. So I held down the power button to hard reset and boot up again to get the same result. Hard Reset and Black Screen twice more. I rebooted for the fifth time and the black screen suddenly got the little white cursor at the top left corner and Windows continued to boot. After Windows fully booted I installed the Nvidia GeForce Game Ready Drivers and selected for the GeForce Experience to be installed as well. After the installation it wanted to restart so I let it and got the endless black screen again. Another hard reset and Windows booted up with the external monitor plugged into the eGPU working as well. I setup the display settings to only display on the external monitor and started to run Unigine Benchmarks. OpenGL received better results than DirectX 11 which was interesting but other than that everything seems stable and fine. I then installed EVGA Precision XOC to underclock the card just to be safe in Windows. Hopefully you will be able to get things working from here. I will update the build guide with more detailed instructions about how I actually installed Windows. Perhaps starting from scratch will help if you still can't get Windows to boot with the eGPU. If all our hardware is the same then there is absolutely no reason that it should not work for you. The only other thing that could be preventing recognition is the way in which Windows is installed. That's just my guess though. Good luck!! I can get eGPU works in EFI Bootcamp windows 10 now. 1) Audio not work, but can be solved by external DAC. Did your EFI bootcamp windows 10 got the same issue? Aha, this is what I was afraid of when I mentioned the "way in which Windows is installed." Audio and RAM are fine on mine. I installed Windows as Legacy BIOS and you seem to have installed it as UEFI. I don't know if this is the culprit but I suspected as much. However, before reinstalling Windows there are a few things you can try. Right-click the Windows Menu at the bottom left of the screen and select 'Run'. Or hold the 'Command' key and 'R' key on the keyboard to open the run dialog box. Then type msinfo32 and press 'Enter'. In the System Information window presented to you make sure you are running a 64-bit version of Windows. Next to 'System Type' it should say x64-based PC. If it says x86-based PC then you are running a 32-bit version of Windows which cannot use more than an little under 4GB of RAM. If you are running 64-bit then that is not the problem. This window will also show you how Windows was installed. Next to 'BIOS Mode' it should say either Legacy or UEFI. If it is Legacy then you would have the same install as mine. UEFI is more secure (apparently) but gave me issues in the past. Now make sure macOS recognizes the full 16GB. If macOS doesn't see all the RAM then take them out, put them back in and check macOS until all 16GB are recognized. If all the RAM is recognized in macOS then they are seated correctly in the RAM slots and it's Windows fault. The only other thing I can think of would be to go into msconfig and change the Maximum Memory in BOOT Advanced Options. Then type msconfig and press 'Enter'. The System Configuration Menu will open. Go to the 'Boot' tab, select your operating system and click on 'Advanced Options'. Now in the upper right corner of the window there will be a 'Maximum Memory' section. You can either input your RAM there or uncheck the checkbox. If the sound isn't working properly then just reinstall the RealTek audio drivers from the Boot Camp Support Software folder. You don't need to reinstall everything only the RealTek Drivers in BootCamp5.1.5621 / BootCamp / Drivers / RealTek / RealTekSetup.exe. If you can't get the RAM situation fixed then I can only suggest reinstalling Windows under Legacy BIOS. I understand this would be annoying but it is the only other thing I can think of since there is no actual BIOS to change settings in on Macs. the most annoying thing is the BIOS Mode bootcamp windows 10 is perfect, no igdkwd64.sys and RAM problems, but the eGPU can not be detected from boot. 1) eGPU can be detected under UEFI boot loop program and I am 100% sure it can also be detected in EFI bootcamp windows 10. I have never used Nando's DIY eGPU Setup and actually didn't use anything to get Windows to use the eGPU. I installed Windows in UEFI mode, installed Boot Camp Support Software, installed Windows Updates and eGPU works. I only have 8GB of RAM and all of it was available for use. Audio does not work and this is due to the Windows DSDT table root bridge definition constraints and how it allocates PCIe devices. This is why Apple does not support UEFI Windows on our iMacs since the EFI is not fully compatible. There is a workaround for this but it involves using the Clover Bootloader which is geared toward hackintoshes and not recommended for true Macs as you can completely brick them. Interestingly, I noticed that UEFI Windows would often freeze at the Windows Logo at boot with no loading indicator. I find this to be similar if not that same as the black screen in Legacy BIOS mode. I also have to hard reset and boot again until a loading indicator would appear below the Windows Logo and continue booting. Therefore I believe that the success rate of eGPU recognition is roughly the same under both Legacy BIOS and UEFI in regards to Windows. It always works in macOS. I do not recommend using Windows in UEFI mode on Macs that don't support it. I know you said that Legacy BIOS mode would not recognize the eGPU but it is the preferable option. Before doing anything drastic I would make sure your RAM is properly seated in their slots. Take out every stick of RAM and put them in different slots. If that doesn't work then remove all but one stick and see if Windows will use all of just one stick. If you cannot get your current UEFI setup to recognize and use all your RAM then you'll have to reinstall Windows. I suggest installing in Legacy BIOS mode and trying to get the eGPU recognized. You may not be motivated to try Legacy BIOS mode again but I can assure you that it is the best option for our particular iMacs. 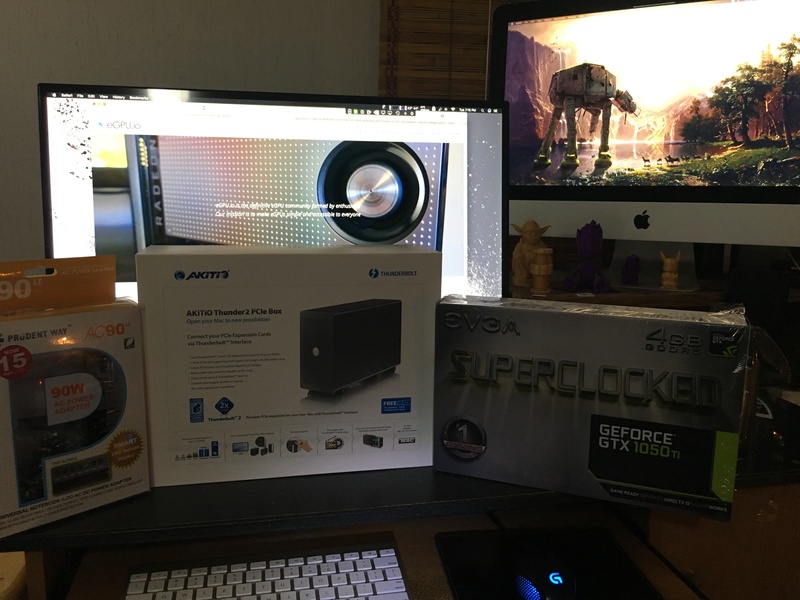 I know you read it before but I'm going to describe the process I use that works for 21.5 inch Mid-2011 iMac 2.5Ghz with discrete AMD Radeon 6750m, AKiTiO Thunder2 and EVGA GTX 1050ti SC 4GB. If you are using different hardware then that could be a reason my methods aren't working. Install Windows in Legacy BIOS mode without connecting to the internet. Once the install is complete and you have reached the Desktop: install Boot Camp Support Software 5.1.5621. It will ask you to restart after installation completes. After restart, connect to the internet and install all Windows Updates. Windows will need to restart to finish installing updates. Plug in eGPU before restarting. If you get a black screen, wait ten seconds then hard reset. If you get another black screen, wait another ten seconds before hard reset. If you are using a traditional HDD then you should wait longer than ten seconds. I am using an SSD so ten seconds is fine. Another thing you can try is to hold down the 'Option' key at boot to enter the Apple boot manager. Instead of selecting Windows immediately you can wait twenty seconds. This might give time for the eGPU to fully start up and connect to the logic board so when Windows begins booting the PCIe device allocation is ready. Do this a few times if it's still not working. Eventually the black screen will get a blinking white cursor in the top left corner of the screen and Windows will continue to boot. After Windows finishes booting you should then install Nvidia drivers. At the time of this post the current drivers are 417.71. After installation and reboot the eGPU should be recognized and in use. I know it must annoy you to be reading through this again given you spent so many hours already trying it. It does work for my iMac so it should work for yours. I did not get the RAM issue under UEFI so we must have used different methods to install Windows in UEFI mode. I highly suggest you try Legacy BIOS mode again using my instructions. Remember that if you are using a normal HDD and not SSD then you should wait longer at the black screen before hard resetting. Patience is key here so don't try a few times and then reinstall under UEFI. If you still cannot get it to work then install Windows under UEFI again and hope the RAM issue is resolved. I'm sorry, I wasn't able to fix your installation. I tried other methods and doing some more research but the only advice I have is to install Windows in Legacy BIOS mode. Look at it this way: sometimes when you go to put a USB in the port it won't go in. So you flip it around and it still doesn't go in. Then you flip it around to the original direction and it suddenly goes into the port even though it didn't the first time. Maybe it's like that. This is why I haven't used Windows in ages. macOS just works every time at every boot. I really hope you get it working. Good Luck!! tried 20 times before sleep, no luck. did your eGPU enclosure powered up and keep running the display card before the thunderbolt cable plug in the mac? Yeah, I leave the Thunder2 plugged in to the iMac at all times. It doesn't have a power switch like the Node. When the iMac turns on so does the Thunder2. If I shutdown the iMac then the Thunder2 turns off. You probably already updated the Node firmware and I don't think that would make a difference in Windows detecting it. I could be wrong though since I don't have any experience with it. Just keep playing around with hotplugging at boot. Try leaving the Thunderbolt cable plugged into the Mac before boot with the Node ON and the fan on the graphics card running. Then boot the Mac. Try holding down 'Option' and loading up the Apple Boot Manager and then plugging in the eGPU and waiting for it to start up and get the graphics card fan going. After ten seconds then hit 'Enter' or click on the the Windows partition. Try hotplugging the eGPU during boot at the Windows logo and before the loading indicator comes up. Try this with the Node already on and running. Try leaving the Thunderbolt cable plugged in and the Node OFF. When the Windows logo appears quickly switch it on before the little loading indicator circles thing appears below the logo. Try the previous two suggestions but after the loading indicator comes up. I remember back in the old 10.12 Sierra days I had to hot plug the eGPU at the Apple logo to get macOS to recognize it. It was always a hotplugging guessing game in those days. Just keep trying different ways you can think of and hopefully it will eventually work. Just be careful with that Thunderbolt port. We only have one!! Many people with the Node on Macs use a DSDT override. These people are on much newer Macs though so it might not apply to our iMacs. It also means you'll be building from scratch since there are no premade ones for the iMac Mid-2011. This should be the last resort in my opinion. Although I would end up trying every option if I was in your position I'm sure. Don't give up!! Will GPU work with this mac? Plug and play or is there is additional parts to purchase? I heard the Evga GTX 1050 TI works for this model, but only seen on the Mac laptop. and can use the iMac screen or I have use ex-display? There is nothing to worry about. If you plan on using macOS High Sierra then it's easy. People have more trouble getting Windows to recognize the eGPU. For macOS it's as easy as running the Purge-Wrangler script. The script will install the Nvidia Web Drivers and enable eGPU over Thunderbolt 1. You plug in the eGPU and reboot. It's really that simple nowadays. For Windows you'll have to figure out the particular method of plugging, hot-plugging and rebooting that works for your setup. You should be aware that there are currently no web drivers for Mojave. Nvidia is supposedly working on them but I do not believe this to be a priority for the company. Apple has nothing to do with it. In fact, Apple is improving their own Nvidia support with every update to Mojave. These are for Macs with Nvidia cards built in such as yours. Apple is not going to create drivers for products they don't sell obviously so it's down to Nvidia to provide web drivers for the newer cards. If you plan on using Mojave then get one of the AMD cards officially supported by Apple. If you are set on using a Nvidia card then you must use macOS High Sierra for now and wait for web drivers to be released for Mojave. I would recommend using an external screen for the setup process. It is easier to determine if everything is working properly with an external monitor. A simple TV with HDMI will work. After you are sure macOS is using the eGPU for acceleration you may then use a headless adapter such as this NewerTech one to remove the need of an external screen. You will get another hit on performance if you decide to use the internal iMac screen since the information is being passed back and forth on the same Thunderbolt cable. You will still setup your display preferences as two screens and launch all apps on the 'fake' headless display. You then use the Spectacle app to move apps to your internal iMac display with keyboard shortcuts. Everything else comes down to the eGPU enclosure and card you use. Any Nvidia card with web driver support should work just make sure your enclosure has enough room and power for it. I used the EVGA 1050ti since it fit within the AKiTiO Thunder2 enclosure and had a power draw of 75watts so I only needed a normal laptop charger to power the whole thing. If you have any problems feel free to ask and I'll try to help. I'm not an expert either though. I am not going install Mojave because the Nvidia issues no way!!! your specs - mid-2011 21.5" iMac HD6750M + [email protected] (AKiTiO Thunder2) + macOS10.13 & Win10 so did you get your iMac screen to work instead of using a ex-display? even a Apple tech guy told me too. BizonBOX are repackaged AKiTiO Thunder enclosures for twice the price so I would just buy AKiTiO. Other World Computing recently acquired AKiTiO and they are a quality company I have used for all my Mac upgrades. You don't have to buy an old enclosure if you want to be more future-proof. You can use a Thunderbolt 3 to Thunderbolt 2 Adapter with a USB-C eGPU and Thunderbolt 1 Macs. The NewerTech headless display adapter will let you use your internal iMac screen. There will be another 5-10% performance hit without an external monitor. I have never tried to only use the internal screen on mine since I had a spare 27-inch monitor but I could with that adapter. More recent Macs allow internal screen acceleration because they are built for it and are compatible since they have Thunderbolt 3. We are hacking our old Thunderbolt 1 Macs to work so the bandwidth through the port just isn't there. If it were then Apple would officially support it as well. I would update to High Sierra if you plan on using the eGPU in macOS. The compatibility with High Sierra is amazing. I would have to play a hot-plugging game in Sierra to get it to recognize the eGPU every boot. High Sierra never fails to detect it and utilize it. If you plan on getting a Thunderbolt 3 / USB-C enclosure then you might have difficulty updating the firmware on Windows 7. Some manufacturers require Windows 10 to update the firmware so you should do some research before purchasing to make sure that whichever enclosure you end up buying has firmware update software which is compatible with Windows 7. Either way you should definitely be using fan control software such as Macs Fan Control to increase your fan speeds in Windows. Apple has crafted macOS to intelligently monitor and control temperature in Macs. Windows does not do proper power management in Boot Camp on Macs and will naturally run hotter than macOS because of this. Since you have experience dealing with thermals then you understand the importance of keeping your hardware properly cooled especially during gaming. For $795, you will get the Sonnet eGFX Breakaway Box, GTX 1080 graphics card, an Apple Thunderbolt 3 (USB-C) to Thunderbolt 2 Adapter and a Thunderbolt 2 cable. I recommend you to upgrade to Windows 10, Windows 7 is not compatible with eGPUs. There is no need to purchase any additional software. You will get a detailed step-by-step installation manual. You will be able to use the iMac screen.